Fancy staying at a chic hotel full of quirky surprises near the center of Scotland’s largest city? 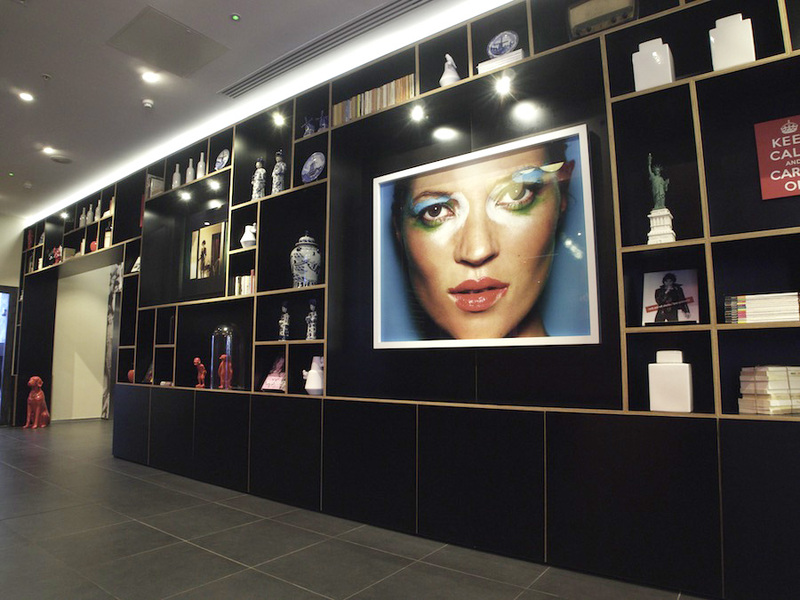 Then citizenM in downtown Glasgow may be just the place. From the moment you walk through its sliding doors and see ornamentations including a giant painted face and a bright red enamel dog, dwarf and penguin, you sense your experience at this 198-room property could be a little different to the norm. Even check-in is different, with a bank of computers in the foyer allowing guests to do it all themselves. A hotel assistant is on duty to help. Surprises continue with glass, bubble-shaped seats suspended from the ceiling in the business center to the left of the lobby while the sitting room to the right is scattered with bright, multi-colored chairs, seats and sofas, its shelves stacked with vintage items such as typewriters, sewing machines, transistor radios, bell jars, used suitcases and model airplanes. A small café fronts bare varnished wood tables with computers in the corner for guest use. The surprises continue on the first floor where the shelves of a visually dramatic bar and deli, with 24-hour service, is lined ornamentally with everyday goods such as tins of baked beans, jars of pickles and bottles of ketchup, vinegar and Tabasco sauce. Here, black pillars, stools and chairs contrast sharply with red counters, cushions and low-slung coffee tables. As a drinks choice, try the citizenM martini with lavender, violet and lychee. Lantern lamps hang from the ceiling while large windows grant generous views on to the street below. Large adjoining rooms feature several televisions and offer comfortable seating, ranging from padded chairs shaped like question marks, to long, leather sofas. Surreal-style photographs adorn the walls including one depicting a suited businessman briefcase in hand but wearing an elephant’s head and trunk and a child wheeling a pram with a giant camera in it. Our 7th floor room reminded us of a rocket capsule, not so much because of limited space but how compact it was, with all its elements IKEA-style snug against each other. The King-size platform bed, for example, fits tightly wall-to-wall across the room’s single window offering a cosy place from which to view the cityscape outside. Shower and toilet are enclosed in a ‘pod,’ floor-to-ceiling plexiglass, and a sink stands outside in the bedroom area. Emphasizing the futuristic nature of the property, many things in the room are remote controlled via a tablet including the operation of the television (with free-to-watch movies), radio, alarm and electronic blackout blinds. The tablet also offers a selection of ‘mood lighting’ settings including ‘romantic,’ ‘party,’ ‘relaxing’ and ‘business’. An overall white decor makes the room seem more spacious than it actually is. While rooms are far from spacious, citizenM offers a comfortable city stay with a convenient downtown location close to many of the city’s main attractions as well as an upbeat, funky décor that should bring a smile to your face. Posted in Luxury HotelsTagged citizenM, city destination, Europe, Glasgow, holiday, hotel, Scotland, Scotland’s largest city, travel, vacationBookmark the permalink.